After a positive first two months of 2019, gold and silver prices are now downtrending. Since the beginning of March, gold has declined 1.5% to close at $1,292.75 per troy ounce and silver has fallen 1.7% to close at $15.295 per troy ounce on Monday. To avoid a loss, investors may want to curb their positions in gold and silver producers that are trading at a premium to their intrinsic value. Any further depreciation in the price of the commodities will cause the share price to retreat to lower levels. Warning! GuruFocus has detected 2 Warning Sign with HL. Click here to check it out. Investors should try to take some profit off the table with Hecla Mining Co. (HL). Shares of the U.S.-based producer of silver, gold, lead and zinc appear to not be expensive based on the chart below. Following a 43% decline over the 52 weeks through March 11, the price is now below the 200, 100 and 50-day simple moving average lines. It is also 6% above the 52-week low of $2.17 and more than 80% below the 52-week high of $4.15. The 14-day relative strength index of 40.15 suggests the stock is approaching oversold levels. 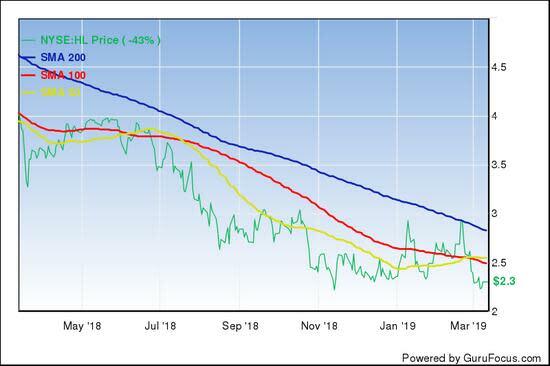 At a level somewhere between 20 and 30 for the 14-day RSI, shares of Hecla Mining may be trading around $1.9, which is the approximate intrinsic value for the Coeur d'Alene, Idaho-based miner. I computed this value by taking into consideration the company's guidance on equivalent gold production of 572,000 ounces for full 2019, a volume of approximately 483 million shares outstanding and a cumulative average gold price of $1,303.3 per troy ounce. My estimate also includes the production of 22,000 tons of lead and the production of 57,000 tons of zinc I have forecasted the miner will produce in 2019. Add to my selling thesis a moderate profitability and growth rating of 5 out of 10. Hecla Mining has an earnings before interest, taxes, depreciation and amortization margin of 25% of total revenue, which came in at $567.14 million in 2018. The modest margin indicates gold and silver must skyrocket on the market in order for Hecla Mining to top several of its competitors since the expected 5.7% increase in equivalent gold production may be not enough to drive profitability upward. The revenue decline and an operating loss of $39.1 million were caused by lower silver production and prices. The operating cash flow fell 18.7% to $94.2 million in 2018 from $115.9 million in 2017. At year-end 2018, Hecla had 191 million ounces of silver, 2.9 million ounces of gold, 932,000 tons of zinc and 774,000 tons of lead in proven and probable reserves. The company's largest mineral deposits are the Casa Berardi Mine in Quebec with 150,000 ounces of gold and Greens Creek in Alaska with 50,000 ounces of gold and 7.7 million ounces of silver. 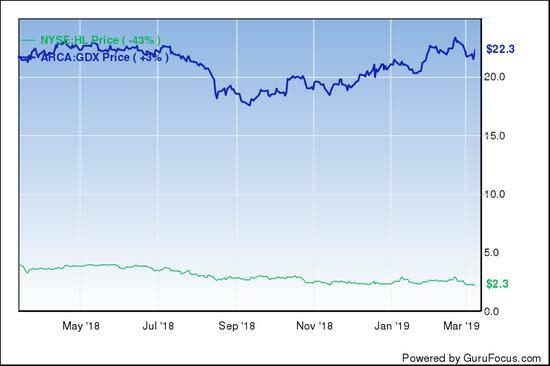 For the past year through March 11, the stock has underperformed the Van Eck Vectors Gold Miners (GDX) exchange-traded fund by 46%, indicating investors have preferred other players in the industry. Wall Street has a hold recommendation rating for shares of Hecla Mining with an average target price of $3.17 per share. Disclosure: I have no positions in any securities mentioned. Will These Falling Knives Rebound in 2019? Hold Shares of AngloGold Ashanti Ltd.
Should You Think About Buying Liberty Property Trust (NYSE:LPT) Now? Is State Street Corporation (NYSE:STT) Potentially Undervalued? Is Now The Time To Look At Buying VMware, Inc. (NYSE:VMW)? Autogrill S.p.A. (BIT:AGL): What Can We Expect From This High Growth Stock?